Kenya Women Holding was born with the delivery of “the double bottom line that it must meet social and financial goals” as its guiding principle. “Over 60 per cent of Kenyans do not have a bank account, and we are ahead of the rest of Africa. For Africa to develop its potential, financial inclusion is a priority." Is democracy good for business? Is liberal democracy compatible with religion? Should the major institutions of global governance be reformed, or scrapped? Do terrorist attacks justify giving greater powers to security forces? These and many more questions will be raised and discussed during the 4th Athens Democracy Forum, which will be held in the Greek capital on September 14-18. Organized by The New York Times this illustrious gathering is set to bring together individuals leading the way in their respective fields, including Jennifer Riria, Group CEO of Kenya Women Holding Company. March 8, 2016 – Oslo, Norway: On International Women’s Day, UNDP Administrator Helen Clark highlighted the role of female business leaders in driving positive societal change as she announced this year’s Business for Peace Honourees.Helen Clark, Administrator of the United Nations Development Program, announced the three winners of the 2016 Oslo Business for Peace Award; Sarah Beydoun from Lebanon, Dr Jennifer Nkuene Riria from Kenya and Tore Lærdal from Norway. Dr. Jennifer Riria, founder and Group CEO of Kenya Women Holding has been named as the Africa Economy Builders – Entrepreneur of the Year Award for 2015. She will be the first woman from East Africa to win this prestigious pan-Africa award that seeks to reward and recognize persons who have contributed significantly to Africa’s growth. The award was won in the master category for the Kenyan region. The internationally acclaimed entrepreneur awards being held in Monte Carlo, Monaco saw Riria represent East Africa alongside other regional master category winners from more than 145 cities in more than 60 countries across the globe. Few women in the microfinance world are as recognizable as Jennifer Riria. 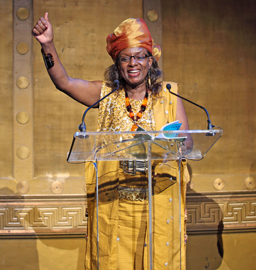 She is the CEO of Kenya Women Holding, twice-voted Ernst & Young Entrepreneur of the Year (East Africa and Kenya respectively in 2013 and 2014) and a Ford Foundation “Champion of Democracy.” She was first female Board Member of the Nairobi Stock Exchange and the Chair of Post Office Savings Bank for four years. She is also the chair of Women’s World Banking’s Board of Trustees. This level of success however, more so for a woman in a patriarchal society like Kenya, was not easy. Jennifer Riria is an entrepreneur with a mission. Her career has been focused on transforming the lives of women – and with them, their families – in her native Kenya. Today, she is group chief executive of Kenya Women Holding, a microfinance, banking and insurance group that works with 900,000 women, employs 2,800 people and since inception has disbursed $1.3bn of loans, each one averaging less than $600. "My definition of mentors is people who will get women to move to the next level. It is not the ones who say ‘be good and be nice,’ no. Whatever it takes to move you to the next level, take it. Mentorship is a slow process, perhaps even slower for women being mentored into leadership roles because they will also be breaking the barriers of culture and the ladders of tradition at the same time." "Women disproportionately face financial access barriers that prevent them from participating in the economy and from improving their lives." - Dr. Jennifer Riria is the Group CEO of Kenya Women Holding and one of Africa's leading women entrepreneurs who has always been on a mission to transform the lives of women and their families in her native Kenya. She is distinguished as a microfinance banker and practitioner, researcher and gender specialist. She has served in many leadership roles for which she has been recognized locally and internationally. In 2013 she was awarded the Ernst & Young (EY) Entrepreneur of the year, East Africa, and subsequently, the EY Entrepreneur of the Year Award 2014, at which point she was admitted to EY’s Global Hall of Fame. "We have proven women are bankable. That you can invest in women and they can be trusted to pay back and grow their business." The end of January draws to a close a focused month of storytelling, aimed at celebrating and acknowledging the incredible achievements and impact being made by Africa’s inspirational women social entrepreneurs. At Lionesses of Africa, we salute their life-changing contributions to making the African continent a better place for all who live and work there. The Ford Foundation today announced a program of special grants and activities to celebrate its 50th anniversary working in Kenya, Uganda and Tanzania. The centerpiece of the program is a $2 million grant for the Tuvuke Initiative for Peaceful and Fair Electoral Process in Kenya—a national campaign being undertaken by a diverse group of 17 Kenyan NGOs and coordinated by Kenya Women Holding, a longstanding grantee of the foundation.